The U.S. Air Force and Boeing anticipate more missions of the X-37B space plane to finish testing the craft's flight characteristics and carry top secret experiments into orbit, but there is no firm timetable for additional launches of the robotic mini-space shuttle, according to military officials. The first X-37B space plane on the runway after landing Dec. 3 at Vandenberg Air Force Base, Calif. Credit: Boeing Co.
Boeing's Phantom Works division built two X-37 vehicles for the Air Force Rapid Capabilities Office, a unit managed from the Pentagon that develops shadowy and fast-track programs for the military. The second X-37B, also called the Orbital Test Vehicle, launched several hundred miles above Earth Saturday on an Atlas 5 rocket from Cape Canaveral, Fla. It will stay into orbit for up to 270 days, according to Air Force officials. With short wings, V-shaped tail stabilizers and a landing gear, the spacecraft launches into orbit inside the nose cone of an Atlas rocket, opens cargo bay doors and unfurls a solar panel for up to nine months of operations, then returns to Earth with a fiery atmospheric re-entry and glides to a precise runway touchdown on autopilot. But almost everything the unmanned space plane does while in orbit is classified. All of the research objectives are also guarded by the military. 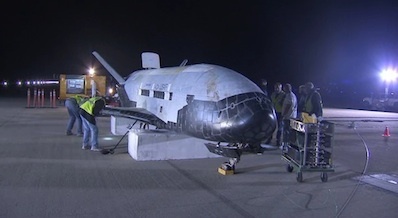 Saturday's launch came three months after the first X-37B successfully made an automated landing at Vandenberg Air Force Base, Calif. That vehicle is now being examined by a team of military and industry engineers. Engineers from the Air Force Research Laboratory and NASA are also participating in the post-flight assessment, according to Maj. Tracy Bunko, an Air Force spokesperson at the Pentagon. Officials expect to fly a third OTV mission, but the Air Force has not decided when the flight could launch. The Atlas rocket manifest from Florida is jam-packed through 2012 with critical NASA and military missions, so a launch opportunity may be hard to find in the next two years. 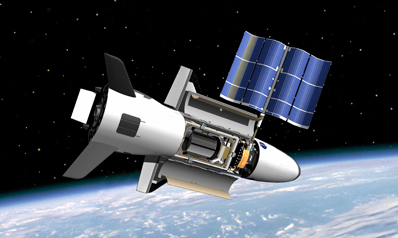 Artist's concept of the X-37B in orbit. Credit: Boeing Co. The Air Force has said the X-37B could also launch from Vandenberg Air Force Base or fly on a Delta 4 rocket, but officials haven't made formal launch arrangements for future missions. The next OTV mission, if approved, would reuse the space plane that spent nearly eight months in orbit last year. "A third flight is anticipated, but no decision has been made for when OTV 3 will launch," said Lt. Col. Troy Giese, the X-37B program manager from the Air Force Rapid Capabilities Office. "Since OTV 3 would be a re-flight of the first flight vehicle, the refurbishment of that vehicle will play a major part of that decision." Bunko said the OTV team has been focused on launch preparations for the second X-37 flight and did only a quick-look assessment of the first mission before giving the go-ahead fo Saturday's flight. "We do anticipate additional flights in order to meet all of the test objectives, but OTV 1 has not been scheduled for another launch," Bunko told Spaceflight Now. "Because of the short timeframe between the landing of OTV 1 on (Dec. 3) and the launch of OTV 2, the team has been busy getting ready for the second test flight. This included a quick-look assessment of the re-entry and landing performance of OTV 1, shipping OTV 2 to the launch base, and integrating OTV 2 to the Atlas 5." Another flight of the first X-37 vehicle would prove the system's reusability, one of the program's major objectives that has yet to be demonstrated. "We're pleased with what we've seen so far," Bunko said. "Technology assessments are ongoing in areas including re-entry guidance, navigation and control, thermal protection systems and flight actuation systems. Assessments will continue during the refurbishment of OTV 1, which will demonstrate the reusability of the X-37B."